We’re proud of our Oklahoma teachers! Local music educator Julianne Annesley shares how the UCO College of Fine Arts and Design prepared her to train the next generation of musicians. During her time at the University of Central Oklahoma, Annesley was a part of the Wind Symphony, Marching Band, Orchestra and Cantilena Women’s Choir. She was also selected by audition for the National Flute Association Collegiate Honor Flute Choir in 2009 and 2010. Since graduating with a Bachelor of Music Education (Instrumental) with a minor in Vocal Performance in 2011, Annesley has dedicated the last eight years to directing band and orchestra, as well as teaching music appreciation. Annesley was recently recognized for researching and reviving Bishop McGuinness Catholic High School’s alma mater song. Because of her efforts to promote school spirit through music, the school has begun several new traditions, including musical performances at the freshmen welcome event and Veterans Day Assembly. Read more about Annesley’s work at newsok.com. Today, Annesley teaches at three Catholic schools in the Oklahoma City metro while also working to complete her Masters of Music Education. She is currently a member of the Oklahoma Flute Society Adult Flute Choir, serving as a Delegate on the Executive Board and as the Honor Flute Choirs Assistant. As students are dissuaded from pursuing their passions in arts-related fields, we’re flipping the script on “starving artists” and highlighting the breadth of success our alumni have achieved as musicians, artistic directors, talent managers, dancers, actors and so much more. As our alumni can attest, #CFADWorks! Are you a CFAD alum? We’d love to hear from you! To get involved, just post a selfie or video of you at work to Instagram, Facebook or Twitter. Use #CFADWorks, and we’ll share your story! Thank you for inspiring our students and the future generation of creators! Backstage at “Hamilton: An American Musical,” UCO College of Fine Arts and Design alumna Erin Clemons finds a moment amid the whirlwind of rehearsals to share her journey since gradation. Returning to the Broadway stage, Clemons is currently starring in “Hamilton: An American Musical.” This critically-acclaimed musical boasts hundreds of accolades, including 11 Tony Awards and the Pulitzer Prize in Drama. Clemons is a member of the ensemble, and she has also portrayed Angelica Schuyler, Eliza Hamilton, Peggy Schuyler and Maria Reynolds. Clemons remembers UCO as an environment where she was able to hone her craft under the guidance of professionals that have evolved into lifelong friends and mentors. For tickets to see her performance in “Hamilton,” visit hamiltonmusical.com. On the set of primetime medical drama “Chicago Med,” UCO College of Fine Arts and Design alumna Milena Govich pressed pause on a busy week of directing her first network television episode to send an update to her alma mater. Upon graduating from the University of Central Oklahoma in 1999 with degrees in Vocal Performance and Pre-Medicine and minors in Dance and Violin, Govich’s launch to stardom began on Broadway. Appearing in shows such as “Cabaret,” “The Boys From Syracuse” and “Good Vibrations,” Govich’s acting chops were quickly recognized, and she transitioned into a prolific career on television. Selected as one of only eight filmmakers in the American Film Institute’s prestigious Directing Workshop for Women, Govich has found success as a director as well. She is also a part of the Sony Pictures Television Diverse Directors Program. Her award-winning short film, “Temporary,” has been featured in festivals across the country. Her latest project, “Unspeakable,” premiered at South By Southwest in 2018, and Govich has directed episodes of “Chicago Med” and “Chicago Fire” that will appear this season. In 2017, the University of Central Oklahoma honored Govich for her accomplishments by presenting her with the Distinguished Alumni Award. She currently resides in Los Angeles with her husband and producing partner, writer David Cornue. 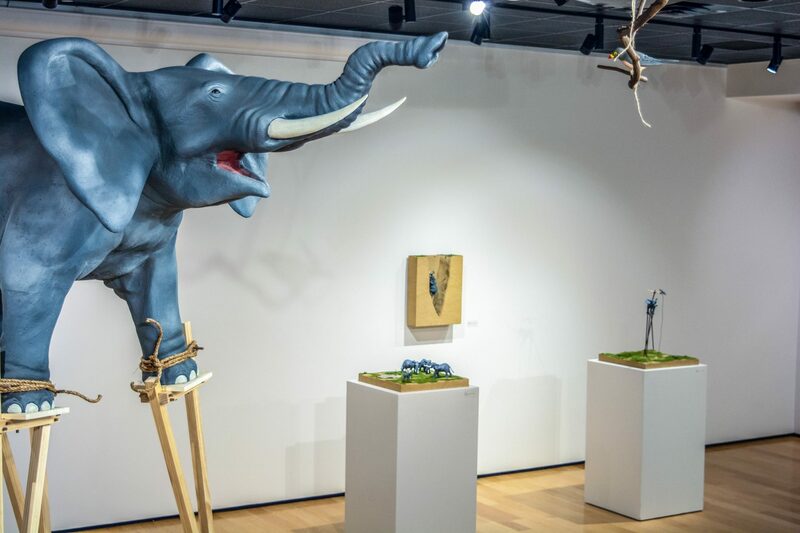 Stacey Holloway, artist and Assistant Professor at the University of Alabama, Birmingham, visited UCO’s campus last week to install her sculptures for the Melton Gallery’s current exhibit “Flight of the Elephant,” a project spearheaded by UCO Design Department Chair, Amy Johnson. 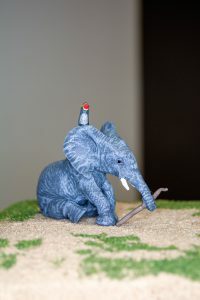 The story of “Flight of the Elephant,” created by Johnson and Sam Ladwig and illustrated by Jime Wimmer, Adam Coe and Semin Park, narrates the migration of a creative and determined elephant, Amelia. Ladwig, who worked with Holloway at the Herron School of Art & Design, knew she would be a perfect fit to produce works directly inspired by their story. When Holloway arrived to the Melton Gallery, she hopped out of her van and cheerfully pulled out her electric drill, which she subsequently did not put down for the rest of the day. Her polished and meticulous technique for creating sculptural work was apparent as she began to un-drill a large wooden crate system that she built by herself to safely transport her work from Birmingham to UCO. 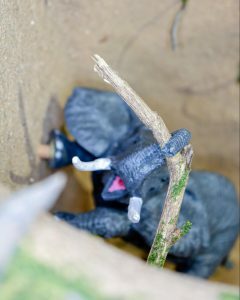 As I watched Holloway drill together eight-foot tall stilts, hang a flying elephant from the ceiling and piece together a miniature scene of an iron-cast herd, I saw Amelia’s story come to life. Prior to Holloway’s arrival, I asked her a few questions in order to get a better sense of her work. Our Q & As are below, highlighting her inspiration for this particular exhibit and work in ecology and visual storytelling. 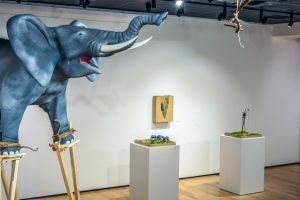 Kyle Cohlmia: Is each installation a part of a larger story of the elephant, Amelia? Were you directly inspired by the design work from Jime Wimmer and her collaborators Adam Coe and Semin Park? Stacey Holloway: Yes, to both of these. I love the story of Amelia that Jime created, and I really wanted to make sure that I’m illustrating the story correctly, but in three-dimensional form. The idea of flight is something that shows up in my work quite often. Flight, for me, is a representation of something that we strive for; something that we achieve. KC: Do specific parts of these installations serve as metaphors for larger issues? If so, which parts (stilts, wings, etc.) and what do they represent? SH: Stilts and wings have always represented the idea of growth for me. Stilts are so interesting because they are used for both entertainment and in building. I first began putting animals on stilts within my work to illustrate the idea of having to learn to walk all over again; not fearing change or having to start something new. Everyone worries about change, but usually you learn, gain or achieve something new from change. KC: How do these installations compare to your past works (in both content and process)? SH: I’ve often portrayed the idea of flight and narratives in my work, but I consider myself a visual storyteller, so collaborating on this project was perfect. Following Jime’s story, I am able to exhibit work that illustrates a more extensive story/idea than what I usually do. I am also extremely intrigued by interspecies friendships and often depict different animals interacting with each other. The idea of two creatures (with different physical characteristics and capabilities) using their combined attributes to make their “herd” stronger is a concept I often use. KC: What draws you to the subject of ethology? SH: I use animals in my work because their specific attributes can be used as metaphors of human nature. As a child, my mother and I volunteered at a wildlife rehabilitation center, rode horses together and our home was practically a zoo. My family and I have strong empathetic connections with animals. I had such unique childhood experiences with animals—nursing a flying squirrel back to health to helping mom train and raise a disabled cockatiel. I actually wanted to be a veterinarian as a child, but was drawn to art at an early age. It wasn’t until graduate school that I found that I could use my interest in animals to translate my ideas to my viewer. Humans are not so different than other animals; we just have more direct ways of communicating with each other. Animals have their own methods of communication; body language, sounds and scents are used to declare disfavor, profess love, announce dominance and express pain. Just like other mammals, human growth can be intimidating and exciting, which is typical; however, we spend a great deal of effort masking this from each other. I’m often drawn to herd animals. I’ve been particularly interested in exploring the notions of adaptability and acceptance because of my nephew’s struggle with social autism. Through my research, I have found that interspecies adoption and friendships have become common occurrences, so I often use one “outsider” herd animal and embed them into another herd, either exaggerating the anxiety and fear of the “outsider” or posing them in a way to express their desire to be accepted. 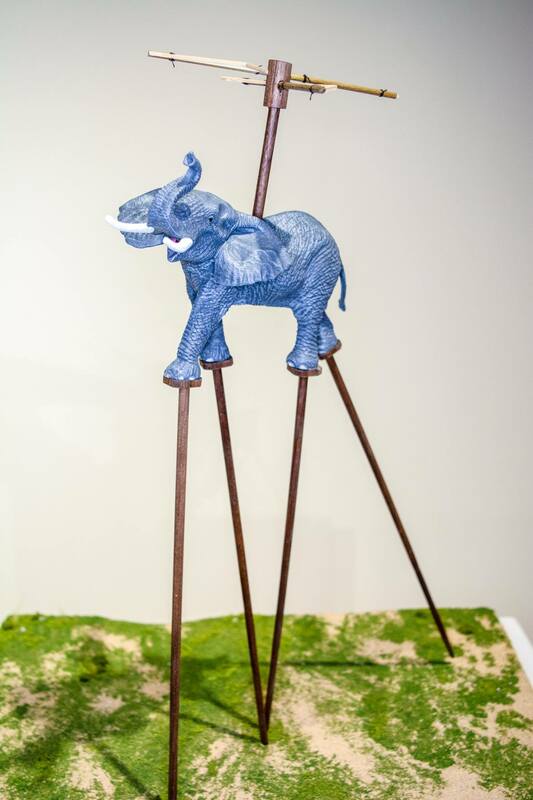 “Flight of the Elephant” will be at the Melton Gallery through Oct. 25 with an opening reception on Oct. 13 from 5:30-8:30 pm. The gallery opening precedes musical performances by the UCO Wind Symphony presenting the world premiere of an original score by Scott McAllister. Performances are at 7 p.m. 8:30 p.m. at Mitchell Hall Theatre. To reserve seats for the performances, visit www.mitchellhalltheatre.com or call the Mitchell Hall Box Office at 405-974-3375. 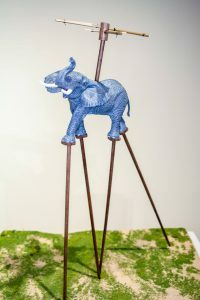 All donations and 50% of art sales during the exhibit directly benefit WildAid, an organization that raises awareness of the elephant poaching crisis, supports lawmakers in banning ivory sales and measurably reduces consumer demand for ivory. The Melton Gallery is free and open to the public 10 a.m. to 4 p.m. Mondays-Thursdays and on Fridays by appointment. For more information about the Melton Gallery, visit www.meltongallery.com.